Is Your Portfolio Built for Your LifeNeeds™? *Exchange Traded Funds (ETF), mutual funds and individual stocks are subject to risks and fluctuate in value. Neither asset allocation nor diversification assure a profit or protect against loss. International investing involves special risks including increased volatility, political risks, differences in auditing and other financial standards. Small-cap stocks have historically experienced greater volatility than average. High yield, lower-rated securities generally entail greater market, credit and liquidity risks than investment grade securities and may include higher volatility and higher risk of default. Bond prices are sensitive to changes in interest rates and a rise in interest rates can cause a decline in their prices. Past performance is no guarantee of future results. No representation is hereby made of the risk and/or return of any particular portfolio. There is no guarantee that any suggested investment strategy will work in any market. You should fully and carefully consider all objectives, risks, expenses and fees before you invest. **Portfolios are illustrative only. 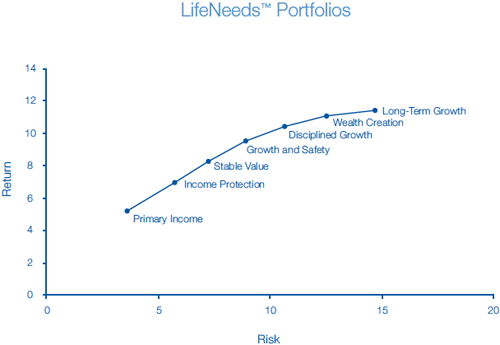 Actual LifeNeeds™ Portfolios will vary from time to time as determined by Idaho Trust Bank. No representation is hereby made of the risk and/or return of any particular portfolio. There is no guarantee that any suggested investment strategy will work in any market. You should fully and carefully consider all objectives, risks, expenses and fees before you invest. Past performance is no guarantee of future results.